Terroristic attack on the Arameans of Beth Zalin/ Kamishli after inauguration of Aramean Genocide monument by Patriarch Afrem Karim. 19-12-2012: Syria: Has the time arrived to carry out a false flag attack with chemical weapons to be used by the colonial powers as pretext to invade Syria? 2-8-2012: Balkanization of Syria: Who will be the winners and who will be the losers? What will happen with the indigenous Arameans present in this area since thousands of years? 18-5-2012: Is the colonial demonic plan being activated to ethnically cleanse Syria of its indigenous Aramean and other Christians? 3-12-2011: “The use of mercenaries, death squads and snipers by Western intelligence agencies is well documented,, Will the ethnic cleansing of the Arameans of Iraq serve as a example to the future ethnic cleansing of Arameans of Syria? 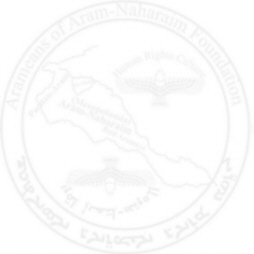 6-7-2009: Arameans of Aram-Nahrin Organisation sent a letter to the President of Syria, Dr. Bashar al- Assad on the situation of the Aramean indigenous people. 5-5-2013: Del Ponte "Our investigators have been in neighboring countries interviewing victims, doctors and field hospitals and, according to their report of last week which I have seen, there are strong, concrete suspicions ...."
Beheading: Barbarism of worst kind. 24-7-2013: Syria - Middle East. Rebels murdered over 200 Christians, including families with children. 21-10-2012: FSA Genocide against Minorities in Syria World must unite against FSA!!. 30-6-2013: Syrian soldiers last words: "Forgive me dad, they're going to butcher me…. I am in slaughterhouse, they will behead me now…. " 24-4-2014: Ottoman genocide: 99 years ago, will it be recognized before its 100th anniversary? 19-7-2010: Centuries Old Aramean church of St. Jacob of Nisibin in Tur Abdin in Turkey is plastered with racist, anti-Aramean and antichristian slogans. 20-5-2009: Aramean Organizations sent a letter to the President and Prime Minister of Turkey on the Aramean Monastery St. Gabriel and recognition of the Aramean indigenous people as a distinct ethnic minority. 28-2-2009: Turkey, Kurds, the Aramean monastery St. Gabriel and worldwide Aramean protest. 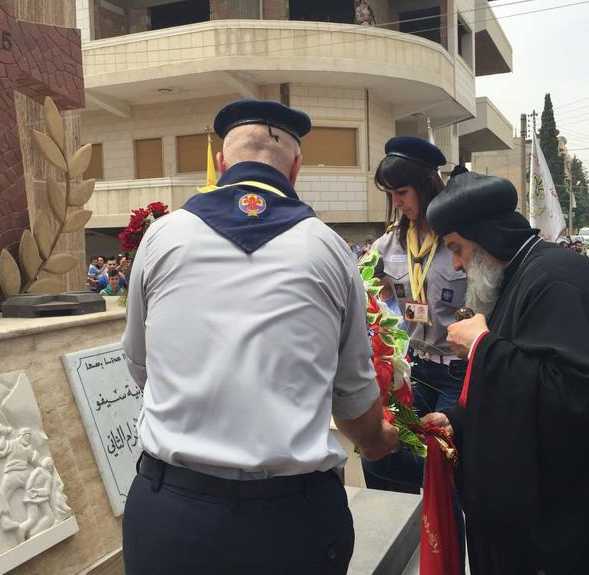 Beth Zalin / Kamishli, Syria- On Sunday 19th of June 2016 the Aramean Patriarch Afrem Karim of the Syrian Orthodox Church inaugurated a monument in Beth Zalin / Kamishli in northern Syria in memoriam of the Aramean (fake: "Assyrian") victims of 1915. The monument is in the Aramean Christian district Al-Wusta of Beth Zalin. 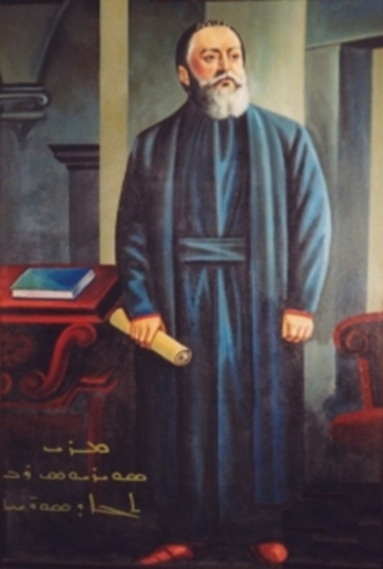 After the inauguration of Aramean genocide (fake: "Assyrian") monument, patriarch Afrem Karim addressed the faithful to hearten them to continue fighting for the land of their forefathers. After the speech, Patriarch Afrem walked together with other clergy and faithful to the nearby St. Gabriel church where the people had prepared a program for him. About 10 minutes after Patriarch Afrem Karim had arrived in the saloon of St. Gabriel Church, a huge explosion took place at a distance of 50-100 meter from the saloon. To protect the Patriarch, the Aramean Christian Al- Wusta district was carefully guarded by the Aramean militia "Sutoro." A suicide terrorist, dressed as clergy, was on his way to the saloon of St. Gabriel church where the patriarch and clergy at the moment were staying together with faithful. The young man of around 16 year of age was stopped by Sutoro at the checkpoint. During the examination, they immediately discovered that he was not a clergy but a suicide terrorist. He blew himself up whereby 2 members of Sutoro were killed and 11 of them wounded of which two of them very severely. In the meantime unfortunately the third Sutoro member succumbed to his injuries. It is very well possible that the suicide terrorist had targeted Patriarch Afrem Karim. Beth Zalin is situated around 2 km from Turkish border. The Aramean/ Armenian Genocide question is very sensitive in Turkey. The recognition of Aramean/ Armenian genocide by Germany provoked furious reactions from Turkey (here, here, here). In particular, 11 German parliamentarians of Turkish decent get faced with plenty of headaches. President Erdogan wants to test their blood for he believes they are no real Turks. Following threats, the Turkish members of Parliament get police protection. Who the perpetrators are behind the attack on the Arameans of Beth Zalin, most probably aiming at Patriarch Afrem Karim, is very difficult to say. There are many clients who might be behind the attack. The Turks, Kurds or Arab groups have all their own reasons to carry out such attack. After his installation as Patriarch in 2014, Patriarch Afrem Karim tackled the issue of genocide and unveiled monuments in various countries. Therefore, it cannot be excluded that Turkey is behind the attack to make clear that they are not happy with a genocide monument just 2 km from the Turkish border. The suicide attack of 19-6-2016 is the fourth terroristic attack on the Arameans of Beth Zalin / Kamishli. The first attack was carried out on 31st of December 2015 in the Aramean Christian district Al- Wusta killing 13 Arameans (fake: "Assyrians"). The second attack against the Arameans (fake: "Assyrians") of Beth Zalin was carried out on 24th of January 2016 killing four people. The third attack against the Arameans of Beth Zalin was carried out on 22nd of May 2016 killing three Arameans (fake: "Assyrians"). 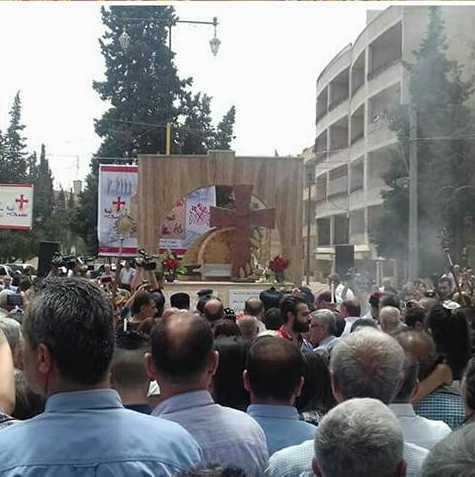 So what will happen with the Arameans of Syria? Well, the anti-Aramean colonial spiritual slavery product “Assyrians” are again engaged in a spiritual fornication with their Western masters and creators that will result in the downfall and extermination of the indigenous Aramean nation of Syria. This is perfectly in agreement with the demonic colonial plan that has been concocted in the antichristian Western colonial laboratories of these wicked powers. And their spiritual children and creation “Assyrians” are a useful tool to achieve this unholy goal of extermination. The question is not if, but when the ethnic cleansing of the Arameans of Syria will start. It depends on how strong and stable the Syrian army is. If in the coming weeks/ months the army disintegrates fast enough, then the hell will break loose and the colonial Western backed death-squads and mercenaries will start with their work on full scale. And those responsible for the bloodbaths, blowing up of churches, chasing away of Aramean people, killing and extermination of men, women, clergy and families and other unparalleled misery they will be facing with, are nobody but the anti-Aramean, antichristian, criminal, colonial product “Assyrians” who commit spiritual fornication with everyone. They call themselves “Christians”, but have totally nothing to do with Christian faith (this is probably the reason why some western “Christians” love them so much). They use “Christian” faith only as a mean to open certain doors that normally would be closed. They have committed spiritual fornication with the PKK resulting in horrible consequences for our people in Turkey, including the present problems and law-suits with the Aramean St. Gabriel Monastery. They have committed spiritual fornication with Bush and Blair that have resulted in the downfall of our people in Iraq. They now are engaged in an unholy marriage with Muslim brotherhood that at the end will result in the downfall of our people in Syria. The "Assyrian" terrorists cannot get satisfied of their wickedness to stack horror onto horror betraying the Aramean indigenous nation. Originally there was only one Aramean militia called "Sutoro" (= Protection) in Beth Zalin/ Kamishli and Hassake. The PKK/ YPG Kurds in Beth Zalin/ Kamishli were not happy about the Aramean (fake: "Assyrians") unity, for it was a threat to them. That is the reason the Kurds started to recruit some apostate occult Arameans who call themselves "Assyrians" among the Suturo militia and created a "new Sutoro", that is the Kurds- Sutoro, to destroy the Aramean militia in Beth Zalin / Kamishli. These dreadful traitors receive money, weapons and training from the PKK/YPG Kurds and serve as their obedient slaves and spies. We are dealing here with awful, dehumanized and cowardice creatures who will do everything for money and unholy colonial product "Assyrianism." To these pathological traitors it means nothing that the Kurds together with Turks have destroyed the Aramean indigenous nation of the Middle-East. In addition to the religious occult (here, here) Arameans who call themselves "Assyrians", the Western colonial powers are responsible for everything that is happening in Syria. Therefore, the real murderers of the awful and criminal terrorist attacks are however the odious Western colonial illuminati powers who started since 2011 an horrific and demonic filthy war against Syria, devastating the once prosperous country (here, here and here). In particular the head of the snake, namely: France, Great- Britain and United States are the evildoers behind everything that is taking place not only in Syria, but also in Iraq. They are the real murderers, committers of attacks, shedding of thousands liters of blood and causing untold human suffering. Syria was together with Iraq, Lebanon and Israel one of the few stable countries in the Middle-East where the Arameans (fake: Assyrians), Jews, Alevits, Shiites and Sunnis unhindered could exercise their faith. The ethnic freedom in Syria and Iraq however was less. In contrast to Israel and Lebanon, Iraq and Syria were led by the Arabic Baath ideology whereby everyone was subdued to the Arabic nationalism. Their number before 2011 was between 1.5 and 2 million. Many of them have left Syria for the Western or Middle-Eastern countries. Please click here for more on the Arameans of Syria. You have the permission to publish this article only if you add the whole link to it and for non commercial purposes only. 28-4-2014: Ottoman genocide: 99 years ago, will it be recognized before its 100th anniversary?